The perfect team-up: the kitchen god for healthy nutrition is now armed with precision blades. 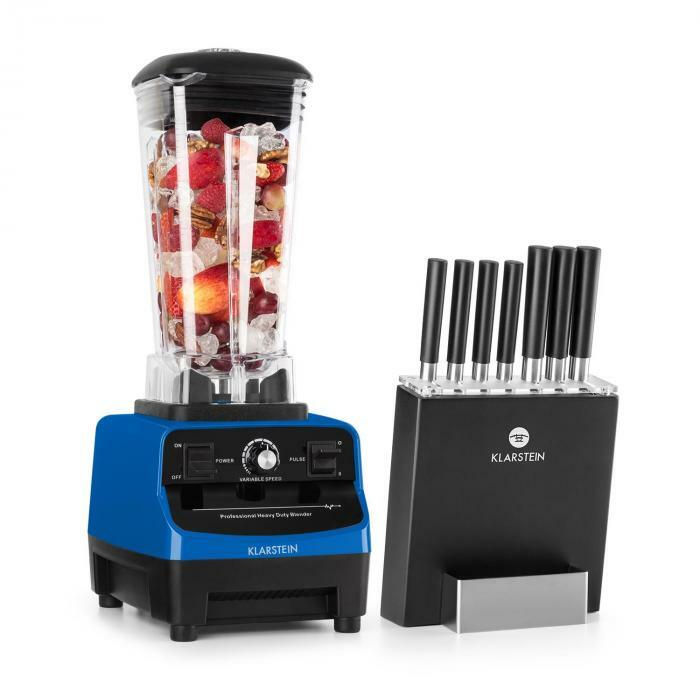 Now the Klarstein Herakles 3G high-performance blender comes in a set with the 8-piece Kitano knife set - it can’t get any sharper! Our strongest in the kitchen: no compromises with the high-performance powerhouse for the best mixing results. 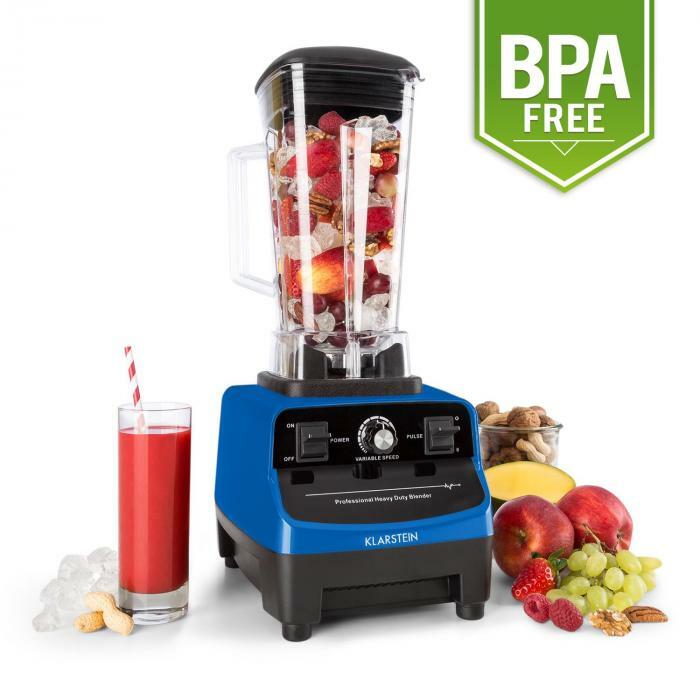 Fruity-fresh smoothies, finely minced ingredients and perfectly mixed drinks or soups - the Klarstein Herakles 3G blender copes with all the tasks the kitchen gods ask of him. Thanks to his incredible strength, he is also the right man for all heavy-duty shredding in the kitchen. The powerful engine delivers up to 40,000 revolutions per minute with 1500 watts / 2.0 hp power - barely possible to have more power! The 6 razor-sharp high-performance blades also cut hard ingredients such as ice cubes, coffee beans or vegetables that other blenders have long since surrendered to. The high speeds combined with the sharp blades also ensure that as many cells as possible are split. This guarantees the maximum amount of vitamins and chlorophyll in your Green Smoothies! Only the best for the family - delicious, healthy and environmentally friendly. Among the Greeks, Herakles was the god of recovery and protector of sports facilities. As such, it goes without saying that we deliberately avoid the use of Bisphenol A (BPA) in the manufacture of Klarstein Herakles 3G power blender. This way, we make sure that the healthy ingredients in the break-resistant plastic mix jug stay healthy! Whether for personal use, for friends & family or at the juice bar: with 2 litres of capacity, you never have to do half the job as it offers enough space for almost every recipe. Vertical inner ribs ensure the turbulence of the ingredients inside and prevent them from sticking to the mixer wall, resulting in extremely homogeneous blending results. Ease of use is the name of the game - for a multitude of applications. No matter what trial the gods imposed on him, Herakles did it with ease. Cooking can go just as easily for you! That’s why we made the Klarstein Herakles 3G high-performance blender especially simple. 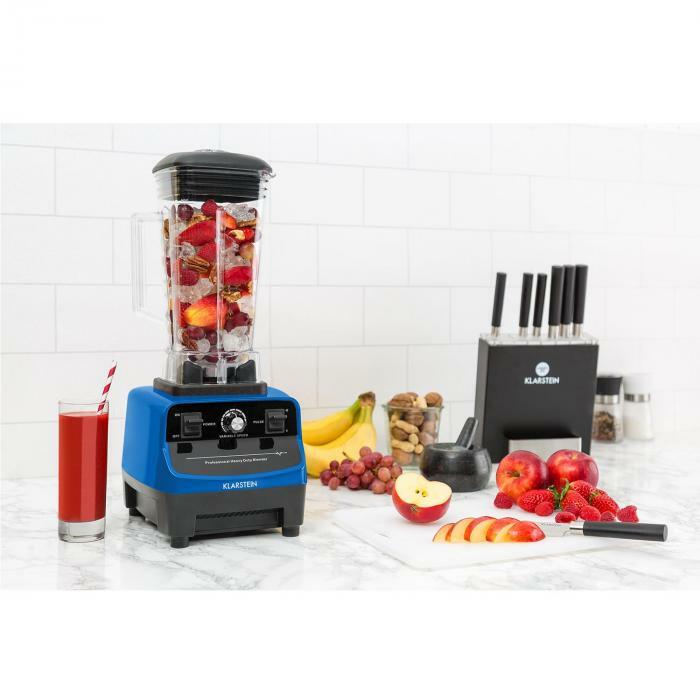 Instead of a confusing flood of functions, everything is operated via a freely-adjustable speed control: slow speed for coarse chopping like chopping onions or meat, and high speeds for pureeing and mixing smoothies or baby food. Here, the individual preparation is guaranteed. For short-term peak performance, the pulse button is also available. Spills and spraying are a thing of the past thanks to the fixed lid. Through its closable opening, additional ingredients can be added during the mixing process. It is also easy to clean, as the cutting unit can be easily separated from the pitcher - the Herakles is made pure and clean after every job! Sharp, sharper, Kitano - the precision knives for the kitchen. For easy preparation of your ingredients, the Klarstein Kitano knife set is the best partner: whether for cutting, peeling or filleting, here you always have the right knife at hand. 7 blades of hardened steel are the ideal tools for chopping, boning, filleting, chopping and shredding. Thanks to their light weight and ergonomically slim-shaped handles, they are easy to hold even with small hands. For tidy storage, a suitable wooden block is readily available. Visually, the knife set impresses with its Far Eastern Japanese design.